The new Freehold Theatre begins to shed light. This pleasant “Black Comedy” inaugurates the Freehold Theatre, a new performance space project based in the Freehold Community Centre in Muswell Hill. A new project about theatre is inaugurated with this good performance. “Black Comedy” is an explosive farce by Peter Shaffer. When the fuse blows for an impoverished sculptor it’s the beginning of a dreadful moment in the dark. “Muswell Hill is a very artistic place. Chris Faulkner – the trustee responsible – gave me the opportunity to do something here for actors. And this is called the Freehold Theatre” Director and Producer, Saima Duhare said. It is always good to hear about a new theatre project. Supported by a small local charity the aim is to provide an opportunity for young Actors, Directors and Producers to show their talents without the expense usually incurred in putting on live theatre. So, if anyone wants to develop a theatre project feel free to contact the Freehold Theatre: “Have a Community Centre and using it for multipurpose, it’s a good opportunity” Saima Duhare said. The opening show is the well-known “Black Comedy” (1965), a one- act play by Peter Shaffer. The piece is a farce set in a flat during an electrical blackout. Full of sensational development “Black Comedy” has a title which is a pun: it is a black comedy, indeed, on the effect a loss of light would have on a group of people. Darkness put out of sight both identity and actions of the people and represents our ability to keep secrets. The physical darkness on stage is a symbol of the moral darkness of the characters. Directed and produced by Saima Duhare for Palladini Productions, the show is a well conceived performance. Actors play good in very difficult roles, especially for the physical effort as it is supposed to be in the complete obscurity. The performance, indeed, is partially played in the dark, spectators receive a little electric torch to enlighten the stage. It is a very good show and the atmosphere of the centre is great. The set is in the London flat of sculptor Brindsley Miller (Joel Kirkpatrick). With his fiancée, Carol Melkett (Amanda Merchant), they are preparing for a party, with the purpose to impress Carol’s father Colonel Melkett and millionaire art buyer Georg Bamberger. Neighbour Harold Gorringe (David Niman), a gay secretly in love with Brindsley, is away for the weekend, so they have stolen the beloved antique furniture as they would like to spruce up Brindsley’s apartment. But suddenly the lights go out, a fuse has blown. From this point on characters arrive one by one in a whirlwind of hilarious moments. Firstly the neighbour Miss Furnival (Teresa Mahoney) a minister’s daughter, a lifelong teetotaller, in fear of the dark. Then Colonel Melkett (Donal Cox) unconvinced by the blackout and with Brindsley himself. Harold Gorringe returns early. Brindsley begins a series of blind acrobatics attempting to replace all of stolen furniture without him noticing. Brindsley’s mistress Clea (Anna Afanasyev) makes her entrance making no sound, so nobody is aware of her presence but they talk about her in a very bad way. Brindsley eventually recognizes her and hides her away. It is at this point that the Polish electrician Schuppanzigh (George Meyrick) arrives, sent to repair the fuse. Due to his accent everyone mistakes him for Bamberger andtry to impress him. Clea comes back and, pretending to be the cleaner Mrs Punnett, reveals her affair with Brindsley. Then Harold finds out what happened to his furniture and is very angry now. And finally the entrance of the deaf Georg Bamberger (Richard Niman). Schuppanzigh returns from the cellar, he throws on the light switch, and the curtain falls. 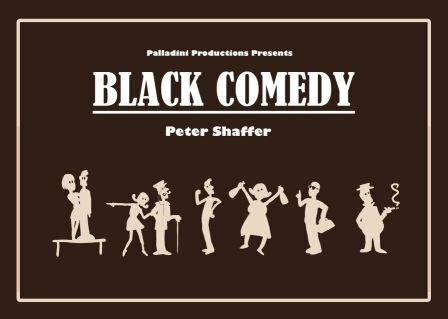 “Black Comedy” was originally written by Sir Peter Levin Shaffer (born 15th May 1926) one of the most important English dramatist, author of numerous award-winning plays, several of which have been filmed, presented on the BBC or played around the world. Shaffer became really famous with “Amadeus” (1979) adapted to film in 1984, a eight Academy Awards winner, including Best Picture. “Next year we do Aladdin for Christmas. We have plans for the next 12 months but we take it step by step. It was great to work with Chris and his family” Saima Duhare said.